Insert a balloon into the tube, and pierce it with two solid spikes. The balloon does not pop but remains inflated! Show the inside of the tube, and your audience can see two spikes penetrating through the center of the balloon. Remove the spikes, and show the balloon to be completely, and amazingly unharmed. In the magician's hand, there is just one torch of fire which will be instantanously changed into seven torches. This item can be connected to an appearing cane. First, one torch is lighted and the changed into seven and at last transforms into a cane. Pieras Fitikides has invented some very unusual effects and marvels for the Magic community. This is his latest and it is a real winner....... The Gypsy's Whisper. A brand new effect using a clever principle in a very unusual way. The uses for this apparatus are mind-boggling. Just one of the effects possible: The performer removes an old laminated photo of a mysterious Gypsy from an envelope; she is gazing into a solid black scrying ball. The performer states that some cultures believe that if their photo is taken the possessor of the photo also possesses their soul. Such is the case with our Gypsy fortune-teller. A playing card is selected by a spectator without the performer knowing its value. The Gypsy is asked to reveal the selected card. Slowly gazing into the black abyss of the scrying ball a faint speck appears; slowly the image becomes clearer and finally it is seen that the name of the selected card is revealed in the center of the crystal ball! Just as mysteriously, the image fades into blackness. Another spectator is asked to select a card and the Gypsy again is asked to reveal its identity. Again, slowly another image appears, the image of the second selected card! This also fades to black at the command of the performer. Anything, and I mean anything can be predicted by the Gypsy; a word, line drawing, number, playing card, serial number, you name it. The effects are only limited by your imagination. The laminated photo comes complete with detailed instructions and everything you need to make multiple predictions. Card measures 8.5 inch x 6 inch and is less than 1/16 inch thick. The Gypsy's Whisper should give you years of performing service as there is nothing to wear out, no batteries, magnets, etc. Self contained. There is nothing on the mental market to compare to this unique effect. Highly recommended by the staff at The Merchant of Magic. This simply looks like an old laminated photo. Is this easy to perform? Yes! The special photograph included does all the hard work , so you can focus on your presentation and enjoy the audiences reaction! Within the pack you will recieve a detailed, photo illustrated book taking you step by step through everything you need to get the most from this versitile device. You will recieve Presentation tips and ideas, special guides for single and double revelations, and much much more! Yes! You are just limited by your imagination! use it with your booktests, card predictions. Why not use it with a pack of Tarot cards for a multi-phase fortune telling routine! Super fast! It allows an instant set up and once your familiar with the method, you could, for example, have two spectators select a card. Then turn to the first spectator and have the photo reveal the card, then turn around to the second spectator and the photo will transform to show their prediction! Is this suitable for working magicians? Yes! It's great for table-magic as it is instantly set up; and its a great piece for the trade-show performer as well. Magician hands the envelope to spectator to see it is thin and flat, and then he explains that it is his prediction and places it on the table. The magician introduces three cards printed with a different color circle on each card. Now the magician invites a spectator to select one card from the three. He then pulls from the envelope a flat greeting card. 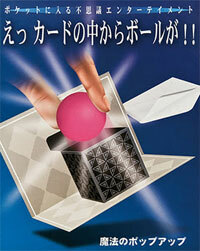 When he opens it, a box pops up and he pulls a solid rubber ball from the 3 dimentional box. The color of the ball matches with the chosen card. You will also receive a capsule. By using the capsule, you may also make a ring, a piece of candy, a message, a bill, or a playing card appear from the greeting card instead of the ball. We supply you a set of four dice which are identical in appearance. However, two of these dice are specially gimmicked, so that they will throw a 1 and 6 when handled in the proper manner. The other two dice are ordinary in all respects. You can use them for a demonstration of any dice game. For example a game of Lucky 7 where the audience wagers on whether a pair of dice will throw under 7, exactly 7, or over 7. You first throw them to show random numbers, then demonstrate how a magician can get them to throw Lucky 7 with every throw. You can use the dice for mental effects, and predict the numbers rolled by a spectator. You would demonstrate the dice throw random numbers then place a prediction on the table, and hand them the dice in a bowl to roll, while they concentrate on the prediction. When prediction is opened it displays two squares with the 1 and 6 spots. You can use these for a number force, or several other applications, as detailed in our instructions. The performer apparently shows two cylinders, under one of which is a bottle, and under the other a glass. The magician makes a magic pass, and the bottle and glass are found to have changed places, with the bottle now appearing under the cylinder where the glass was, and vice versa. This is repeated a number of times and can be played for a lot of comedy. For example an assistant can be chasing the bottle, and every time he selects a cylinder, he finds the glass under it, while the bottle appears under the other cylinder. After a few changes, as the magician is apparently talking to the audience, the assistant creeps up to both the cylinders and finds the bottle in one, which he steals away. He now smugly asks the magician to perform the trick again. The magician apparently unaware that the bottle has been stolen away, continues to perform the trick as before, leaving the assistant and the audience doubly amazed. A very good presentation idea is to show only the glass, after the bottle has been stolen. You lift off one cylinder, and show the glass. You do not lift off the other cylinder, just look a little puzzled, and pretend to bluff, stating here's the glass, so obviously, there's the bottle! The audience starts howling, asking you to produce the bottle, which they have seen stolen! You look embarrassed, and continue with the effect, passing the glass to other cylinder, without showing bottle, and you'll soon have the whole audience screaming! Finally, reveal the bottle under the second cylinder, for a climax! Spun metal non rusting bottles, and crafted powder coated metal cylinders, with routine. A large cube (30 cm X 30 cm X 33 cm) is displayed and shown to be completely empty. You then place into the cube silks/balls or even a small rabbit! Amazingly all these items transform into four large cages that hold artificial doves. 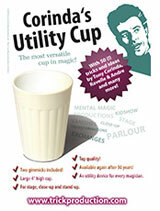 The Corindas Utility Cup is a great utility item! It is an ordinary-appearing plastic cup with which you can perform near miracles. The set comes with the white cup, two gimmicks and instructions for about 50 tricks and routines. Whatever style you use, whatever type of show you do there are tricks included for you! Here is a cute routine using patter about measles! A red polka dot bag is shown to be empty. A solid red silk and white silk are placed inside. When they are taken from the bag, the red silk has WHITE SPOTS on it and the white silk has RED SPOTS on it! When the bag is shown on the inside, there is a boy with measles all over his face. Includes boy, silks, bag and a great routine. An Impression they'll Always Remember! Mark Mason Original Handling! Using just two rubber bands the magician stretches them into several different shapes. You finish by forming the bands into a Star shape. Visually one of the bands actually CHANGES shape and becomes an actual STAR shaped band. Stretch 2 regular rubber-bands into the shape of a star. Visually 1 band changes into a star shaped band. Hand it out for a souvenir. Introducing us to his line of Hand-Made, Magic-Themed Sculptures. Here we have a soda can sculpted into a traditional classic magic trick called Card Stab. Own a unique piece of art. Soda Cans may vary. I started carving Can Man in 1994. One day I looked at a can and wondered what could be sculpted out of it. I had seen airplanes molded from cans and thought the soda logos made a very colorful sculpture. However, I wanted to think outside of the box, or can in this case. My first attempt was to cut out a piece from the can that was already in the shape I wanted to see. However, the first attempt came out looking like a very awkward stick figure. In fact, people that saw it had to be told what they were looking at. As I thought about my first attempt, I realized I could cut out a stick figure, keep it attached to the can, and then mold the figure like a child's bendy figure toy. Eureka - Can Man was born.